As moms all over America look forward to celebrating Mother’s Day this coming Sunday, many are planning to gather with family and friends. Carol Hobby of Clay, for example, will be going out to lunch with two of her three sons, her granddaughter and other family members. Sadly, though, eldest son Matt won’t be part of the celebration. Incarcerated in an out-of-state federal prison, he and his mother are separated by hundreds of miles and heavy metal doors. A long 20-year road of addiction, multiple suicide attempts, theft and hard living (including a horrendous — and nearly successful — attempt on his life by fellow addicts), ended in Matt’s conviction for his involvement in two drug store robberies in 2010. But thanks to her strong faith, a sense of humor and a sizable support system of family and friends, his mother has survived. And through her natural gifts for writing and serving, Hobby is chronicling her experiences as the mother of a troubled child in a blog called “Visiting Prison” at visitingprison.blogspot.com. Her hope is that in the sharing, parents in similar situations will be encouraged, just as she and husband Joe have been encouraged by others. 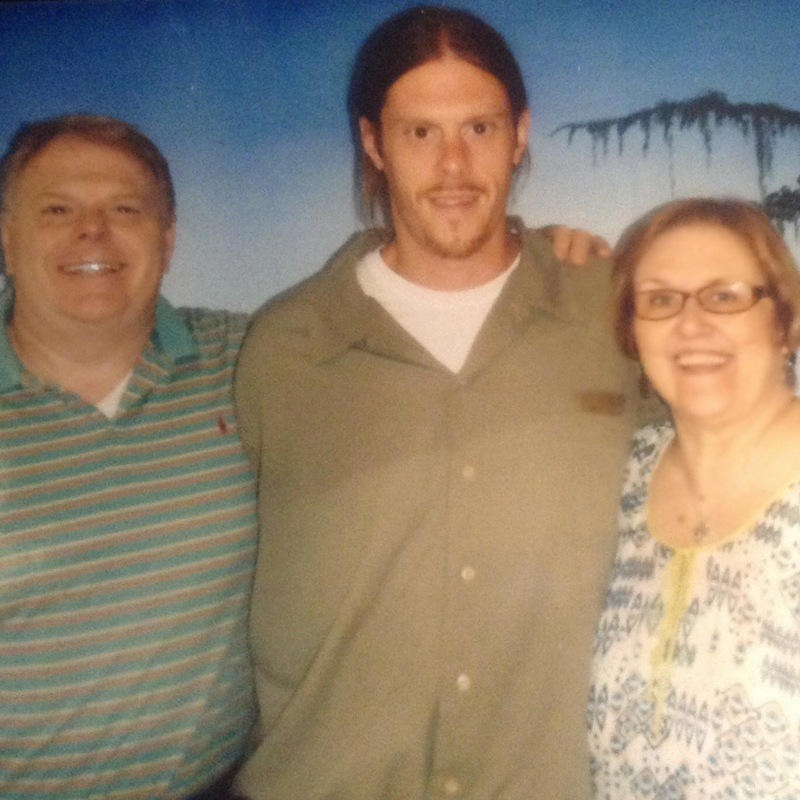 Carol Hobby and husband Joe during a recent family visit with their son, Matt (center), who is currently serving time in a federal prison. Through prison, Hobby said, God has protected her son, given him wisdom and provided words of encouragement from family, friends and church members. Not surprisingly, some of Hobby’s most memorable moments over the past five years have occurred during visits to her son. In her blog, Hobby writes of learning the protocols for entering the prison grounds, successfully passing through metal detectors, where to sit down and where to stand in line with other visitors. She has also learned not to wear underwire bras (no metal allowed), to bring along proper identification and to remind her husband that wearing khaki pants in a prison filled with khaki-clad prisoners is taboo. But mostly she has learned that something as simple as a smile goes a long way toward dealing with the often sour dispositions of prison personnel and fellow visitors. In some of her posts, Hobby addresses the impact one child’s problems can have on the rest of the family. “For anyone who has experienced dealing with a rebellious child, the stress can affect every relationship it touches,” she wrote. “Parents are especially vulnerable since both feel a responsibility in rearing the child. But one of Hobby’s overriding concerns has always been how dealing with Matt’s issues could affect her relationship with her other children. But when all is said and done, the benefit of hindsight gives Hobby some perspective she lacked earlier in life and provides her with the motivation to keep moving forward. Nowadays, though, she marvels at how far her son has come, and she hopes that sharing their experiences can benefit others. In addition to using blogging as a platform for helping others, Hobby has formed HOPE (Helping Other People Endure), a support group to help families struggling with issues of addiction. The group meets every other Thursday at 6:30 p.m. at Faith United Methodist Church in Clay. The next meeting is May 19. For more information, text Carol Hobby at (205) 585-3327 or email her at chobby117@aol.com.